Tools/scripts to run a dedicated server. The server will run as long as an active player is connected to it. Inactive players are kicked after 30 minutes and the game will be paused if no one is left. The server will be shutdown after 60 minutes with no players on it. The game will be saved at shutdown, even if you're not connected to the website to see it. The next time you return to the website with the same browser, you'll be able to start that save game where it left off. I have a question... if I want to start a vanilla game with a setting like "lots of resources" do I just start that locally and then upload the files? I would also like a way to share a URL which would start our server (in case I'm not around and my friends want to play... or I'm traveling and want to play on the road). Finally, it would be great to throw you some money to help with the server costs if you have a way to do that! Thanks again for making this and enabling us to have a great night playing Factorio! If you want a setting like "lots of resource" at map creation time, then you can do as you suggested by starting it locally and uploading that. I don't have a way to accept money for the service at the moment. I'd say it's more hassle than it's worth for now. Perhaps if the usage keeps growing I'll have to consider some options. So far it has just inspired me to optimize the cost. I suppose at some point that might break down though... much like trying to maintain 60 UPS while launching 80 rockets per hour in the game without cheating (and running on the service). I was thinking a simple way to do it might be to also store the cookie info in a DB online. When the user visits from the cookied machine, allow them to create a "one time use" URL with a GUID which dies say 2,7,30 or whatever, days later. The URL can be shared by the user to whoever they see fit and when used the system can pull the cookie info from the DB as if it was reading the cookie from the users machine. Its certainly a bit of work but it would seem to short-circuit the need for user logins and accounts and all that malarkey. It limits the security exposure because the link dies in a number of days, and its authenticated (in a sense) because it was generated from the original browser which has the permanent cookie. 1. Its very far down my list of concerns and I'm very security conscious. 4. DO get Privacy Bagder https://www.eff.org/privacybadger by EFF and then control who gets to put cookies on your machine and what they do. (It will terrify you!). Great Service (Anything FREE is Always a Great Service!!). So I uploaded all the mods we are using, then noticed if I try to go back and Select from the list of uploaded mods, I can only see the first 26 mods (I uploaded 61). Also the settings for the Mod Restack changed from my settings to mostly Zero's. So the first thing I tried to interact with, I dropped over half my inventory onto the ground since I was now over FULL. Anyway to be able to Upload the "mod-settings.dat" file? I'd just want you to know how much I appreciate this service you are providing for us! also as a techie im curious what are the specs of the server/ do you self host, or run it professionally ? Why not add the latest 32-bit version 0.14.9 with support for multiplayer? Hi. 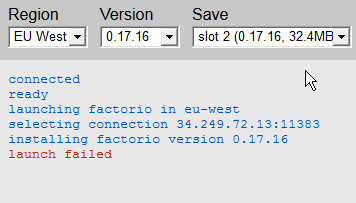 I wanna try your server hosting with my 2 friend but when start the server or upload a map showing for us : "Cannot load downloaded map: Trying to apply migration 2018-08-03_Factorio_0.17.0.lua (Base Mod) while joining a multiplayer game"
We have 0.17.9 version and the server is the same version. Yeah, I am considering something like this. A way to share a session seems to be the number one request right now, so it'll probably be the next feature I add to the service once I get a chance. Oh wow, 61 mods? As a workaround for now, you should be able to scale the browser zoom to see more items at once. I'll consider a better way to manage more mods for the future. There's not a way to upload mod-settings.dat yet. It seems that file would need to be persisted between runs too. Thanks! Glad you like the service. I'll consider adding a way to enter commands back to the server. Check back here for updates. A way to share without a login is high on the priority list, once I get back to working on the list. The service is hosted on AWS and the servers are T3 instances provisioned as necessary. I've gotten this report a few times now. However, I'm not sure how to reproduce it yet. Can you provide some more details? 1) Did you upload a map or just start from scratch? 2) What's the launch id or user id you see in the log output? Or you can send me the log output. 3) Were you trying to use any mods or just the base game? 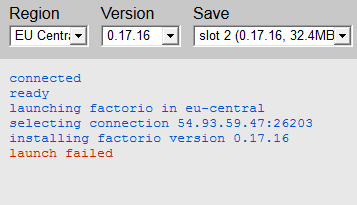 Glad to see there are still free services for Factorio after i-*****.de falled. However, I double proposals for uploading mod-settings, and AT LEAST promoting someone to admin, or starting server with possibility to set "default" admin on server by writing someone's we will to set as admin nick, in textbox. Additional tip: changing server settings to allow players to pause with admin-only mode set to false can help a lot on some servers, too. I can even volunteer for you in any possible way. Also, do you have Discord? If not, can we make new one for factorio.zone ? Do you want your mod to be translated? Request it there: Click! Everytime I got assigned this IP, launch failed. Had luck starting on US-West, we'll stick to it, ping is fine from what I see. I checked the logs and it appears those launches ran into an intermittent bug. There were a number of failed launches today, it seems due to unlucky timing and not specific to a region. I've deployed a mitigation that should workaround the issue for now. I'll follow up with a proper fix after I get a chance to diagnose the root cause. Thanks for reporting the problem! Double proposals noted, good input. First a HUGE thank you. Today a friend wanted to play on a server he paid for, but support was lacking and we couldn´t get it to run. I think it was big file mods restricted, as only the big ones were greyed out there, but noone was goiung to tell us. Not so Factorio Zone. It was very smooth to setup, and after some fails (on our side, mostly mod versions, wrong initial save files and huge lag cos i tried playing at US-West from cenral europe ) we ran it for hours, flawlessly! Admin rights would be awesome. We play modded only, we dont care about console commands disabling achievments and the only easy startup mod we found gave us shields, not exoskeletons. On a RSO rail world with biters disabled.... We´ll cheat some into a singleplayer save and load that, but thats not going to be convenient if more people join. Mod settings: i second that, even tho we dont need it at the moment, but i wouldn´t know how to change startup stuff. Reload a locally modified save? Is there a way to see server stats? Could be helpful to know what a load our (planned) big base is putting on the server. Could tokens be shared? (Export/import) At the moment its not a biggie for us, as we dont play alone and its only us 2. But it could grow, at least a little, and as it is right now, only one owners browser could start it, without another player uploading (the same) mods again from another browser and start from the last save. -There is still no chocolate fund. WHY? But there must be a way. Could i gift you something on Steam? This is absolutely amazing for a free service!